This belt actually goes by two names. The Inzer Forever Lever Belt and the Crain Xtreme Power Belt. Both of these companies have a reputation for providing well constructed and long-lasting belts made from high quality materials. For this review, we are looking at both the 10mm and the 13mm versions that are available. 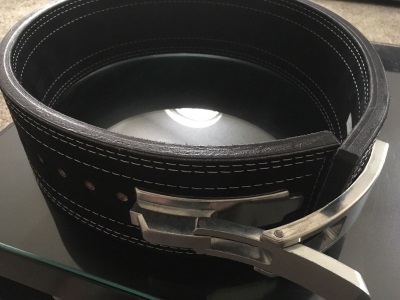 The belt is make from one piece of leather which is very solid while cheaper belts often use layers of thinner leather which are fixed together and sometimes stitched. 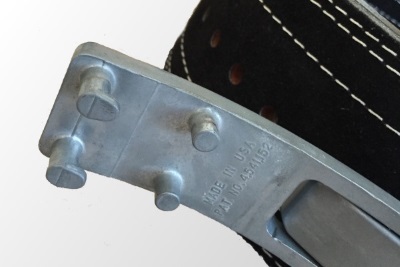 Some belts also have metal bolts which can begin to rust after a while. Over time, these layers can become separated reducing the support that the belt initially provided. At some point these layers on cheaper belts will come apart and the entire belt will need to be replaced. But this won’t be an issue with the Forever belt. 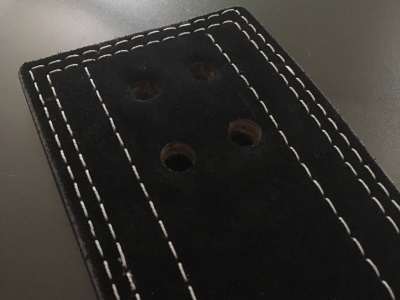 The quality of the belt’s construction is perfect and it is held together by six lots of double lock stitches so no need to worry about rusted bolts. The stitching is also of an excellent quality with no loose threads to get caught and unravel. The holes for the lever mechanism are clean and clearly designed to not get worn out. The lever mechanism is heavy and feels robust so it will clearly take a lot of effort to break. This close-up of the clasp below shows the thickness and the sheer robustness you can expect from the mechanism. The belt’s leather is covered with a non-slip suede which gives it a softer finish and prevents it from moving around during lifts. This feels very nice to touch, again a sign of good quality materials. Inzer provide this in a wide selection of different colours, including pink. But any colours other than black are made to order with a lead time of up to 5 weeks. So bear in mind if selecting a different colour you could be in for a wait. The belt’s lever is quite large, as shown in the picture above. It has two hooks on which fit into the other side of the belt and then then lever is pulled to secure it to the body. When the belt is put on at first before securing with the lever, it is loose fitting. But when the lever is pulled, the belt becomes very tight. This is the whole point of this mechanism. Inzer claim that their lever allows their belt to be adjusted to be up to 3 inches tighter than a normal belt. This can also make the belt so tight that it becomes uncomfortable. The belt is adjusted by removing the mechanism using a screwdriver but a coin will suffice. This means that if two different sized people wish to share it during a session , it can become tedious as this must be removed and refitted for each person to use it. When it is put on too tight, it can sometimes be difficult to take off. 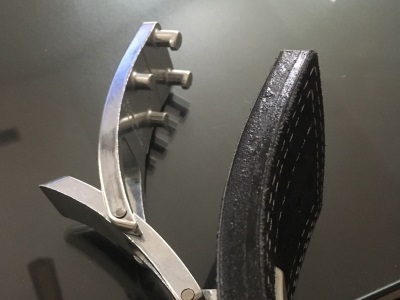 You release the lever to relieve the pressure but you also need to get the teeth of the lever out of the holes on the opposite side of the belt to remove it properly. This isn’t too difficult with some practice but for someone new to weight belts it could be a little embarrassing. The sheer thickness of the belt means that takes a while to break in. It will probably take a few weeks of heavy use before the leather will fit really tight to your body. The thinner 10mm version will obviously be broken in easier. But even when new, the belt performs better than a lot of cheaper belts after they are worn in. For those that enjoy a ridiculously tight fit, this will be a great belt for you. The lever mechanism is so convenient for easily creating that tightness that would be nearly impossible to get with a pronged belt. No more struggling with pulling the buckle tight and trying to hold it in place while putting the prongs in the hoops at the same time. This belt is brilliant for squats! It provides a massive amount of support and you can really brace against it with no worries about it providing great stability. For deadlifts, this is also good but there were a couple of drawbacks. The stiffness of the 13mm version meant that it doesn’t fit the contours of the body until broken in and so for deadlifts it doesn’t provide as amazing support as it does for squats until the leather is supple enough. Also, the bulkiness of the belt means that it can be difficult to use the glutes in lift when initially lifting the bar off the floor. A softer belt (maybe the 10mm) is slightly better suited for deads. At the end of your workout or set, again the lever is very convenient. Just pull it and all that pressure is released. It’s a good feeling! This Inzer/Crain belt is of a very nice quality in both it’s 10mm and 13mm versions. It is more suited to the more serious lifters as it is quite costly too. Those who use it for Crossfit might find it overkill and the size of the belt means that it interferes with some of their exercises such as the clean and jerk. However, for serious lifters, it would be difficult to find a belt that provides as much support as this and if you are currently using a smaller cheaper belt, this will seriously improve your squats. Unfortunately, Inzer don’t do a belt for dips, otherwise we would jump on that one too. Even though the belt is expensive in comparison to others, it is clear from the construction quality that it is going to last a good few years of abuse. This belt is also suitable for female lifters too but if you are female and you are looking a belt which it more flexible and lighter in weight, then take a look at out reviews of the best women’s weight lifting belts. I have this belts and it’s really nice. I can tell that its great quality but like you say, it can seem quite stiff at times. I guess I’ll just keep at working it in and it should become flexible as the weeks go on. A great belt! Got mine 3 years ago and I’m sure it will last another 10 years. That said it takes four months to get one, not eight weeks. Although the Inzer customer service people will tell you it will be ready “any day now”. Just tell me its going to take months not weeks and stop the BS.